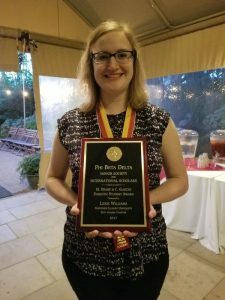 The Phi Beta Delta Honor Society for International Scholars is honoring Lexie Williams, an undergraduate student who recently graduated from NIU with a B.S. degree in Public Health and minors in Business Administration and Deafness Rehabilitation. She served as a student vice-president for NIU’s Zeta Gamma Chapter. Williams was selected as the recipient of the 2017 Marian Beane/Charles Gliozzo Domestic Student Award for International Achievement. This award honors one domestic student who demonstrates exceptional accomplishments in the areas of scholarship and service. Williams excelled at her study abroad program in the Netherlands. She has been very active in the University Honors Program, including recruiting and advising new students. She has been both a Research Rookie and a McKearn Fellow. “She is far and above one of the strongest promoters of global studies, of international engagement and the value of gaining a unique perspective as a result of being present. And now, more than ever, we need such young people spreading the word, supporting the cause,” said former NIU History Professor J.D. Bowers, who nominated Williams for the award.